LifeCycles Tree Care Services offers fruit tree restoration, pruning and education to passionate backyard tree stewards. Our classes and services help you improve your fruit tree’s health, productivity, longevity and beauty. Greater Victoria is the perfect place for fruit tree lovers. With one of the continent’s largest urban orchards, many residents of the region tend fruit trees inherited from historic orchards or planted in their own backyards. Nothing compares to the beauty of spring’s first blooms or the joy of fruit picked directly from the tree. Even with these rewards, keeping your tree healthy and productive can be a challenge. Untended fruit trees can quickly become unmanageable. Pests and disease, if left untreated, undermine a tree’s integrity, longevity and beauty. The good news is that fruit trees are very resilient! With some compassionate care, most trees can be restored and given new life. A well-pruned tree is a thing of beauty – and will continue to give back in years to come. Annual Pruning encompasses a combination of thinning, heading back and removal of dead and diseased wood. Consistent pruning reinvigorates tired wood, and maintains your tree’s size and shape. It enhances the penetration of light and air leading to better tasting fruit (higher sugars and aromatics). Pruning also stimulates the formation of flowering buds and fruiting spurs and is a primary method for removing disease before it becomes widespread. Restoration pruning is a multi-year approach to rejuvenating trees that are older, overgrown, damaged, or significantly neglected. Fruit trees have long lives and most of them have experienced periods of neglect or inconsistent care. LifeCycles specializes in multi-year fruit tree restoration processes that aim to reinvigorate your tree, extend its life and get it to a place where it can be easily maintained with some basic annual maintenance. We use a combination of summer and winter pruning. A well-implemented restoration plan can increase a tree’s overall vigour, disease resistance and fruit production over time. Restoration pruning can also help correct the work of novice pruners (who frankly have done a lot of damage in the urban orchard). We’ve heard countless stories of people regretting giving in to a persistent brother-in-law with a chainsaw or becoming frustrated by city contractors clearing power lines. We can help you out. LifeCycles is passionate about community education. We offer a few different options to help you learn how to care for your fruit trees. We offer workshops at Welland Community Orchard. 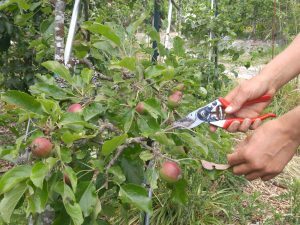 Here you can learn about fruit tree specific skills, such as: pruning, grafting, pollinator promotion, pest management and more. Want a more direct approach? Try our Learn-Along Services. Register for a hands-on session that will take place in your very own backyard. Sessions include summer and winter prune along. If there are topics you want to learn about, let us know and we can design something to fit your needs. Register below for a Summer Prune-Along. If you are planning to plant some new trees or looking for ways to make your existing trees healthier, we also offer on-site consultations. Our consultation may touch on site selection and preparation, species and varietal selections, training systems, pollinator ecology, healthy soil, pest and disease management, irrigation, guild planting and more. Caring for fruit trees is a specialized art, unique in the horticulture world. LifeCycles Tree Care Service is committed to offering holistic, tree-centric care of fruit trees that aligns with your vision and lifestyle. From our 20 years of experience working with backyard fruit growers, we understand the importance and richness of the relationships that people have with their trees. The story of your tree is important to us, and we are committed to cultivating that relationship. Summer Pruning (July - September). After spring growth is when the leafy annual shoots that over shadow your fruit crop should be removed. More light and air means tastier fruit with few blemishes from moisture-loving diseases. Reducing summer shoots promotes fruiting spurs, increases the quantity of fruit overtime and lessens biennial cropping. In addition to more delicious fruit, summer pruning can help control the overall size and volume of your tree and help keep it more manageable. Many plums and cherries, especially early fruiting and flowering varieties, are extremely susceptible to moisture loving diseases; we recommend pruning these species after summer harvest. Dormant Pruning (December - March). While the tree is dormant we remove all dead and diseased wood, and reduce the overall volume of non-fruit bearing wood. This is also the time we like to start tree restoration projects, as the leafless form makes it easier to assess your tree’s needs and make a plan. Winter is the ideal time to prune all your apples, pears, figs, and grapes vines. Over the past 20 years, LifeCycles has developed a deep appreciation for the region's fruit trees and their unique needs. We are proud to work with professionals who are mindful of specific needs of fruit trees and adapt their experience and knowledge from arboriculture, commercial and community orchards to the backyard setting. We offer a specialized and unique set of skills for professional pruning of figs, pome (apple, pear, quince, medlar) and stone (plum, cherry, peach, nectarine) fruits.